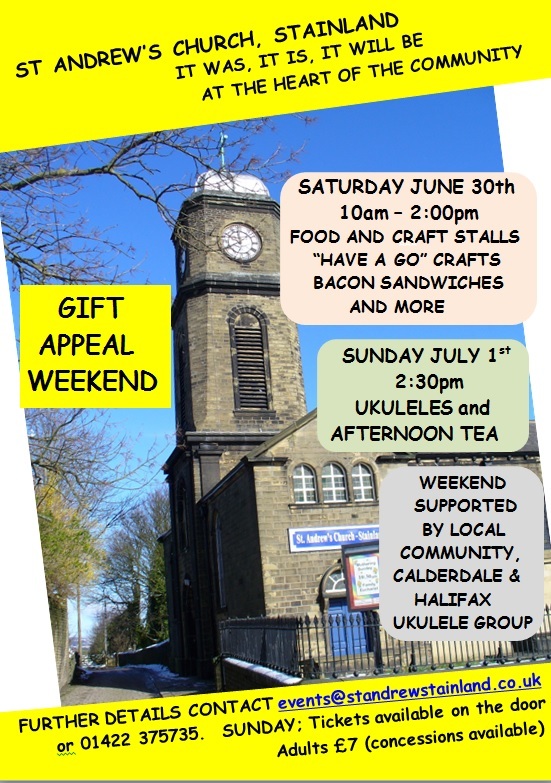 On Saturday 30 June 10:00am to 2:00pm and Sunday 1 July 2:30pm, St Andrew’s Church, Stainland will be holding their annual Gift Appeal Weekend. On Saturday, along with the usual refreshments there will be food and craft stalls and ‘Have a Go‘ crafts. Afternoon teas will be available Sunday and there will accompaniment from the Halifax Ukulele group. For further details contact events@standrewstainland.co.uk or call 01422 375735. SUNDAY; Tickets are available on the door at £7 for adults (concessions available). Remember as well the next Community Cafe is on Monday 18 June, 9:00am-11:00am. Working together with Sowood W.I. 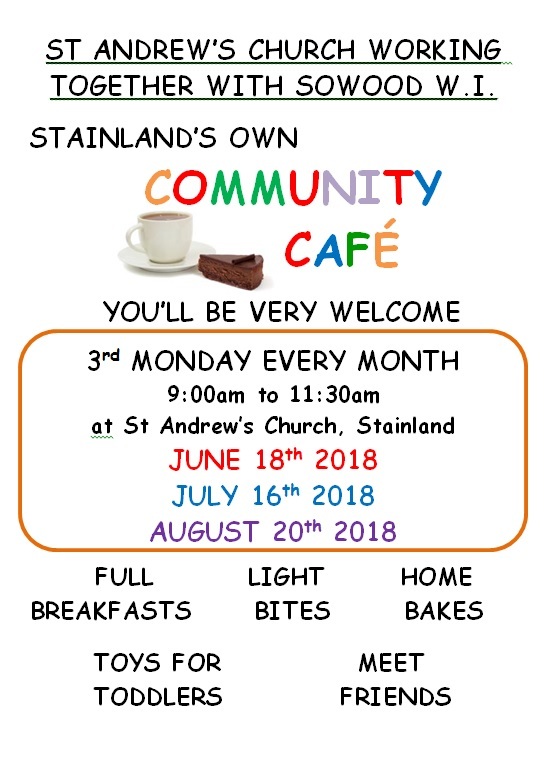 you will be made very welcome to Stainland’s own community café on the 3rd Monday of every month at 9:00am to 11:30am. The next cafes will be on June 18th, July 16th then August 20th. They serve full breakfasts, light bites and home bakes. Meet friends whilst your toddlers play with the toys. This entry was posted in Elland, Events, Get Involved / Have Your Say, Greetland & Stainland, July, June and tagged Sowood WI, St Andrews Church, Stainland. Lower Valley Friday Flyer 15 June – OUT NOW! !